On Friday, September 9th a see-saw battle took place between the highest levels of the federal government; the judiciary, cabinet agencies, and the military disputed the next moves involving construction of the Dakota Access Pipeline. A judge first denied requests to halt pipeline construction, and shortly afterwards the Department of Justice, the Army, and the Department of Interior ruled against the judge’s ruling, ordering the company to halt construction over one site. A day after the governor of North Dakota activated the National Guard to patrol checkpoints around the location of the ongoing water protection encampment, Federal Judge James Boasberg ruled against the Standing Rock Sioux Tribe and their attempts to halt the construction of the pipeline from going under Lake Oahe. 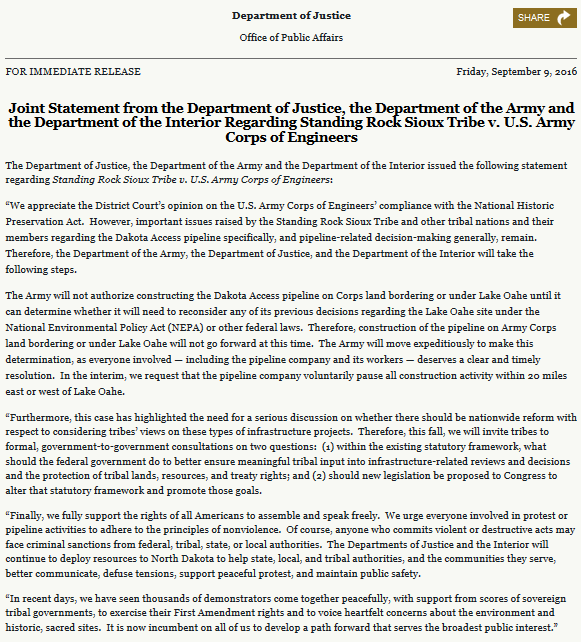 Shortly after the news that the federal Judge had approved the continuation of construction, the federal government issued a “Joint Statement from the Department of Justice, the Department of the Army and the Department of the Interior Regarding Standing Rock Sioux Tribe v. U.S. Army Corps of Engineers“. In the release, quoted below, the federal agencies asked for construction to cease, and called for attempts to respect First Amendment and treaty rights. Water protectors from around the site of the ever-growing encampment and concerned community from around the nation rallied on Friday afternoon in Bismarck, the capital of North Dakota. Unicorn Riot was live for this event. Here is the stream from the event in Bismarck. Follow our social media pages (tw / fb) for more breaking information from the #NoDAPL encampment. To gather more context around the issues, please see below.